Next Tuesday, instead of our super cool weekly meetings, we’ll be hosting The Matt Hart/Michael Meyerhofer Poetry Reading at Bracken Library Room 104 at 7:30. Matt has a new book out, which I’m sure is stellar and Michael is always a fun guy. Also, a soon-soon-soon-to-be-announced Writers Community member will be opening for them. 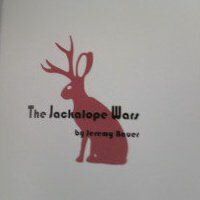 Also, the following Wednesday, there will be a reading at Village Green Records at 7 pm to celebrate the release of Jeremy Bauer’s chapbook, The Jackalope Wars. Lindsey LaVal and Tyler Gobble (THATS ME) will be reading as well. Please come to these readings, see some cool readers, pick up some awesome books, support The Writers Community. I’m gonna get awkward and point you, dear reader, in my direction. Mike Young has come up several times during our meetings, so I wanted to let you know that I have a new post (interview, review, special piece) with Mike Young up at Smalldoggies Magazine. Check it out. SHEWWWWEEEE, mid-terms are over, you are caught up on homework, it’s getting cold. READ. I’m not telling you what to do, just thinking this could help. I know you’re sad sometimes. ME TOO. Also, if you want to get out of your dorm/apartment/house, a cool show at VGR on Saturday, featuring Husband&Wife and their new album, seems like a good destination. I am stoked to announce the completion of a project I spent the summer working on: the debut chapbook of Jeremy Bauer. This chapbook is the first release for Stoked Press. Jeremy Bauer has captured the words that were fighting their wars in space. Now, here they are in poem form, contained but still fighting, alive and kicking. CHECK IT OUT ON GOODREADS. In Jeremy Bauer’s The Jackalope Wars, creation is an event that is still happening all over us. And as the Gods continue shifting our atoms, the only response is war. William Carlos Williams said that “a poem is a small (or large) machine made of words.” Well, these poems are robots that have turned on the master in the sky. There is fire and blood and now my eyes contain lasers like swirling multitudes. These poems are large and they will eat you. Jeremy is a good friend of mine, and I’m real stoked to see his poems see the world on paper this way. I’ve been wanting to put out a chapbook for awhile, and to have Jeremy’s be my first, DAG YES. The official release is next Tuesday, and they will be selling for four bucks. If anyone is interested in purchasing one, let me know. Hey, I’m Jeremy Bauer! Again! Hey, whoa, hi. In my previous post I mentioned writing in the margins (which, coincidentally, is the title of the Writing in the Community publication I am a part of this year that will be coming out soon.!.). Sometimes I have pages where I get on tangents and my margins get primo filled like they’re in an eating contest and man, can they pack away the ice cream and sauerkraut. As a sort of disclaimer (DISCLAIMER..DISCLAIM HER…HE PROBABLY DESERVES IT MORE, I SAW HIM OUT DRINKIN’ AGAIN WITH LENNY ROTGUT AND THEY WERE BURNT TOAST, IF YOU KNOW WHAT I MEAN, HE DIND’T EVEN HAVE THE DECENCY TO CALL, OR SCREAM, OR STAY FAITHFUL, THE TOILET MADE HIM RENOUNCE GOD), I want to say that not all first scraps are good. That’s the point of revision, and I really hope The Greats have bad scraps too, and I think they do. So be gentle, young wielders of the serrated serpent e-tongue. Oh, and don’t be afraid to comment about your views on the visual side of writing, or even start a flickr or something with pictures of your own notebooks. Make connections and keep ’em hard and vibrant like computers are beating us at! "He's One of the Feather Children"
In the middle of this page is my original draft of a poem with the caption’s title. I frequently write notes to myself, sometimes even talk/write to myself, and just jot down whatever’s yelpin’ out my skull at the time. Sometimes I write future. I’m gonna post a few more of these sometime in the near, and remember don’t be afraid to leave comments or discuss your own visual techniques in your writing, physically speaking. in a can of tomatoes. that when the reach the brain make it dead? it can only be obscenely organic? fucks in cans of tomatoes. Hey, this is Jeremy Bauer doing a post as part of the Writer’s Community. Hey, whoa, hey! Now I’ve been meaning to do this for a while, but I finally borrowed some technology so here it is. I like seeing notebooks and scraps and such of writer–seeing their revisions, what sort of marginalia (margin stuff) they’ve added, etc. 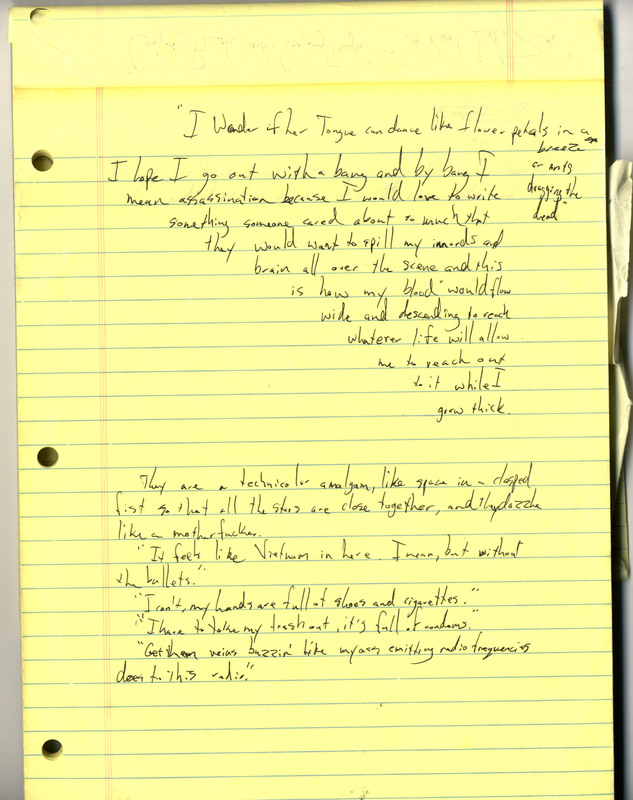 Personally, I write on a variety of things, such as pocket notebooks, legal pads, post its, composition notebooks, and of course the computer, but when using any paper medium I put tags, notes, and whatever else I’m thinking of at the time in the margins. 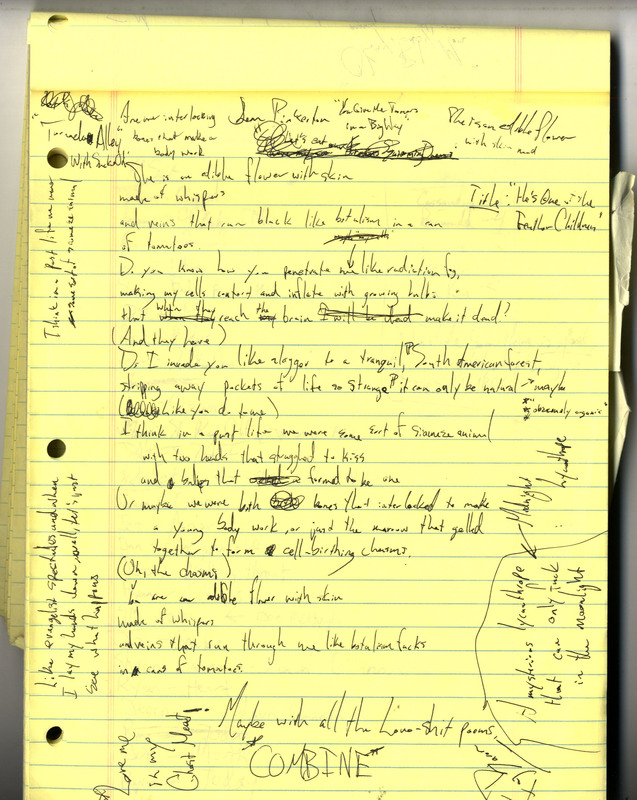 A few weeks ago I saw one of Vonnegut’s original drafts of Breakfast of Champions all taped together with illustrations, penned notes, and all sorts of cool junk at the Lilly Library at Indiana University. I’ve seen various other original drafts of notable literary works and this stuff always makes me curious as to what the notebooks of writers look like. I decided to just scan some of my own and hope other people will do the same with there’s. Show the world that we are visual, writers! "I Wonder If Her Tongue Can Dance Like Flower Petals in A Breeze or Ants Dragging the Dead"
This is a poem I tried to put on my blog, but it was really about the alignment and shape of the poem, which was reflected in the content, and my blog provider or whatever they’re called doesn’t jive with different alignments. Writers are artists and most consider the visual element of their writing. This is why I wanna see the scrap birth. By the way, the stuff below the poem is a collection of snippets that popped into my head for other things or just as standalone lines to be inserted or built upon later.